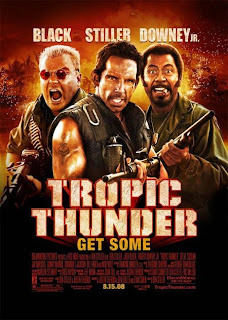 Cam's Cinematic Episodes: Film Review - TROPIC THUNDER: Topic Blundered. Film Review - TROPIC THUNDER: Topic Blundered. 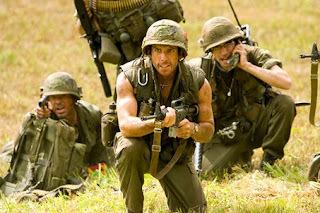 Directed by infrequently successful comedy star Ben Stiller, Tropic Thunder attaches its assortment of gags to the threadbare, yet oddly overstated, plot involving the making of the ultimate Vietnam epic. Casting himself as a fading action star, Tugg Speedma n to be exact, Stiller is but one of the motley crew who make up the imaginary film. There's also Jeff Portnoy (Jack Black), a heroin addicted comedian whose films chronicle the best and worst that flatulence can offer, artsy, not unlike Russell Crowe, Aussie actor Kirk Lazarus (Robert Downey Jr.), who has undergone radical cosmetic surgery to play the film's African American sergeant, Alpa Chino (Brandon T. Jackson), a gangsta-rapper/energy drink entrepreneur actor wannabe and Kevin Sandusky (Jay Baruchel), the proficient hard-working character actor. Behind the scenes are an inexperienced, manic director Damien Cockburn (Steve Coogan), an obscenely enthusiastic special effects guy (Danny McBride), the grizzled writer, Four Leaf Tayback (Nick Nolte), whose book is the basis for the impending production, Tuggman's frat-dude agent (Matthew McConaughey) and last and most definitely least, Les Grossman (Tom Cruise), an vulgar, obese studio exec. Sweet Moses Magnum! We're halfway through this muck. Let's keep on trudgin'! 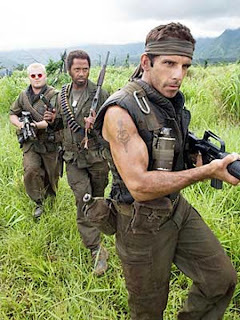 So anyways, the Tropic Thunder production is serious trouble. Money is being spent by the millions while the actors bungle their scenes and the director grows increasingly frantic. After being threatened with being shutdown, Damien Cockburn decides to go all Francis Ford Coppola and journey into the heart of darkness. Thus, he drops his actors in the middle of the Vietnamese jungle, informing them that their actions will be captured by hidden cameras. After Cockburn is removed from the picture (In a moment I wouldn't dare spoil), the clueless actors wander around the jungle bitching about acting methodology, Hollywood practices and whether or not they are still filming a movie. Stiller's character, the most clueless of the gang, eventually separates himself from the group and winds up captured by heroin smugglers, led by a 12-year-old warlord (Brandon Soo Hoo). Meanwhile, the remaining thespians must overcome their pretentious (and drug-infused in Portnoy's case) tendencies and save the dim-witted Speedman. 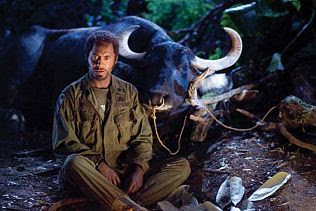 So what did I like about Tropic Thunder? What made me chortle and guffaw? Well, I loved the opening fake trailers, each of which was a false movie starring one of Tropic Thunder's fictional actors. Downey's artsy gay priest film (co-starring Tobey Maguire) was the most uproarious, but I have to give major credit to Jack Black's The Fatties: Fart 2 spot, which tore a vicious strip off Eddie Murphy's Nutty Professor franchise. Regardless, a great way to open the film. 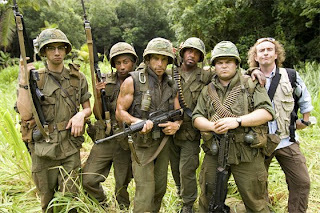 In keeping with the previous comments, a great deal of Tropic Thunder's early material features great jabs at La-La-Land. The film's first 30 mins., which tackles everything from Access Hollywood to condescending feel-good studio fare to dysfunctional sets and actorly whining, is spot-on great stuff. Also, the Vietnam movie spoofs (With a heavy helping of Platoon) and wonderfully cliched music choices had me tittering like an old lady at tea time. I wanted more! But it was not to be. 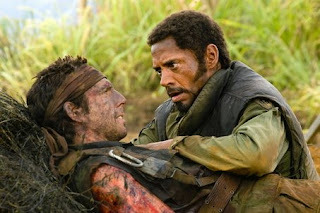 Unfortunately, once Tropic Thunder's plot falls into place the laughs die a fast and painful death. Thus begins over an hour of clumsy physical humour, a lot of bland riffing and a bizarre over-emphasis on kinetic thrills and explosions. The middle section is particularly aimless and tiresome. Sure there are a few chuckles, delivered mostly by Lazarus' obsessive dedication , Portnoy's heroin-withdrawal and one unfortunate panda, but the film seems to lose its nerve. The sharp satire is replaced with Zoolander-style wackiness. As well, this film (purposely?) bungles almost all of its movie-making moments. At least try to make the film-sets and sho oting look authentic. Takes go on too long and are beyond impossibly complex. As well, the film's central conceit, that the actors think they are still in a movie, just doesn't work. Even the most inexperienced of actors would realize that filming with hidden cameras in the jungle is a futile exercise. At least the actors make the trip (mostly) pleasant. 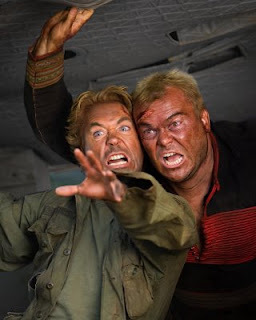 Robert Downey Jr., one of 2008's MVPs, is unquestionably the most hilarious performer in the film. He takes what could be a controversial character and makes him a side-splitting study in well-meaning cultural ignorance. Despite being often difficult to understand, he still manages to walk away with the film. Also great is Jack Black who, despite less solid material as Downey, creates an actual character out of his dope-fiend hack. A scene featuring Portnoy tied to a tree gets one of the film's biggest laughs. Nick Nolte earns laughs simply due to the fact that he literally is a parody nowadays. He plays his role straight, giving lines like "beds give me nightmares" a demented spin. Jay Baruchel, in the thankless straight-man role, is deserving of bigger things. Too bad this film won't get him any. Matthew McConaughey, on the other hand, will likely get some better comedy roles after Thunder. His clueless agent (A role Owen Wilson abandoned) is one of the tougher characters to pull off, and McConaughey makes it look flawless. He even manages to get his lame TIVO jokes to work. That's called "Movie-Star Charisma", folks. On the lesser side, I have to slap Ben Stiller upside the head. He is never convincing as an action film star (Sylvester Stallone or The Rock would have been better, and braver, choices) and is never able to drop his standard ironic brain-dead dolt routine. He does, however, score a major guffaw in the scenes showing his character's bellyflop film Simple Jack, a sappy tear-jerker about a mentally challenged hero. Many will say this bit is too far-fetched, but anyone who saw the trailers for Cuba Gooding Jr.'s Radio will laugh in recognition. Still, I wish Stiller would drop the dumb routine for once and find a new avenue to channel his performance through. Also less-than-memorable is Brandon T. Jackson, whose rapper character was a stale target ten years ago, and Danny McBride, who continues to create vacuums of humourlessness in even decent comedies (The Pineapple Express for example). Here his role is kept to a minimum, which was appreciated. And finally, in a much ballyhooed role, Tom Cruise is a pain to watch. Dressed up in Jamie Kennedy's hand-me-downs, the actor rolls around in flop-sweat in a vain attempt to be funny through sheer force of will. Cruise's angry narcissism, effective in dramas and successfully toned down by better directors, is on full display here. His Les Grossman character is an annoying one-note caricature without any sense of spontaneity or cleverness. Cruise has always seemed fairly humourless, and judging from Tropic Thunder, he is also lacking in any sense of comedic timing. As well, his endless dancing scenes are cringe-worthy and embarrassing. I wish I could recommend Tropic Thunder to y'all, but I can't. As I said right after exiting the theatre: It's extremely hit-or-miss. Unfortunately, more material misses. T oo bad, as great Hollywood satires are few and far between. Oh well, in a summer filled with spectacular entertainments that exceeded by expectations, I'm willing to overlook this disappointment. So, my recommendation is to watch sneak in to see the first half-hour of Tropic Thunder before watching The Pineapple Express. More laughs, same ticket price. ...Now, have you heard the latest Robert Davi joke? P.S. : Personally, I'd recommend you go out and rent Bowfinger, the unfairly overlooked Steve Martin/Eddie Murphy gem, which is infinitely more intelligent, and has far more to say than Tropic Thunder would ever dare dream. Hell, even Kevin Smith's Jay & Silent Bob Strike Back is a superior alternate rental.